Today, the Walt Disney Company is the biggest entertainment company in the world with theme parks, TV shows, movie studios, merchandise, the most recognisable cartoon character in the world, Mickey Mouse. But a long time ago, brothers Walt and Roy Disney started out with just an idea. 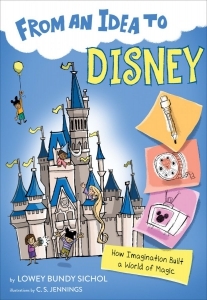 Find out more about Disney’s history, the business, and the brand in this illustrated nonfiction book! Find out what Walt first intended to name his famous mouse. (Hint: It wasn’t Mickey!) Discover behind-the-scenes magic of how Walt Disney World is run. Explore the ways the Disney expanded its brand from a little mouse into media, merchandise, and more!